The brigade consisted of five Vermont regiments that had been recruited for nine months service in 1862. They had spent their entire enlistment assigned to the defenses of Washington and due to their relatively easy service were some of the largest regiments on the field. At the last minute they were ordered to join the Army of the Potomac on its march north to Gettysburg. Two of the brigade’s regiments were detached to guard supply trains in the rear, but after a five day march three regiments joined the army and were assigned to the 1st Corps. The brigade was commanded by Brigadier General George J. Stannard, who was a farmer, teacher, foundry operator and militia colonel in Vermont before the war. 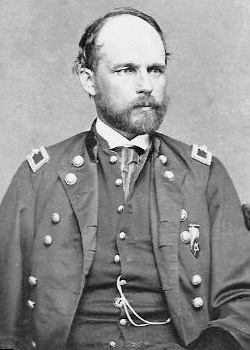 Stannard was wounded in the thigh as he led the flanking counterattack against Pickett’s Charge, but stayed on the field until the end of the battle. 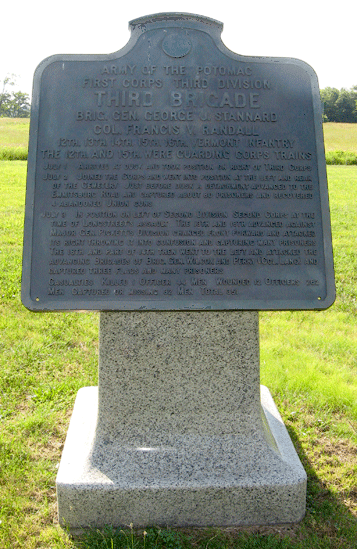 Colonel Francis Randall of the 13th Vermont took over the brigade as senior colonel after the battle. July 1. Arrived at dusk and took position on right of Third Corps. July 2. Joined the Corps and went into position at the left and rear of the Cemetery. Just before dusk a detachment advanced to the Emmitsburg Road and captured about 80 prisoners and recovered 4 abandoned Union guns. July 3. In position on left of Second Division Second Corps at the time of Longstreet’s assault. The 13th and 16th advanced against Major Gen. Pickett’s Division changed front forward and attacked its right throwing it into confusion and capturing many prisoners. The 16th and part of 14th then went to the left and attacked the advancing Brigades of Brig. Gen. Wilcox and Perry (Col. Lang) and captured three flags and many prisoners.